Nowadays Italian Jews prefer to name the tragedy that occurred during the Nazi and Fascist regimes and WW2 as Shoah instead of Holocaust. The term Holocaust became the favourite term to address the Jewish genocide in the 1960s and it comes from the Greek “holokauston”, a translation of the Hebrew word “olah” meaning “completely burnt offering to God”. Shoah means “catastrophe” and is more appropriate. No altar, no sacrifice to a God. In Italy the racial laws were approved in 1938, but on September 8th in 1943 the armistice was signed by Pietro Badoglio and this created the conditions for the deportation of Jews living in Italy to the concentration camps. 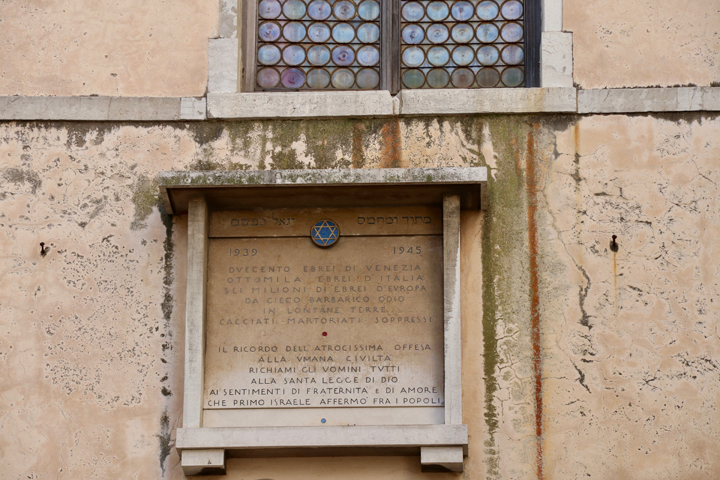 In Italy around 8.000 Jews were killed and in some cities the memory of what happened is kept alive by some art works or memorials, while in some other cities it is still a debate on how and where to remember. Well, if discussions are still held about what to call what happened, you can understand how hard it is to find something that can evoke the tragedy. 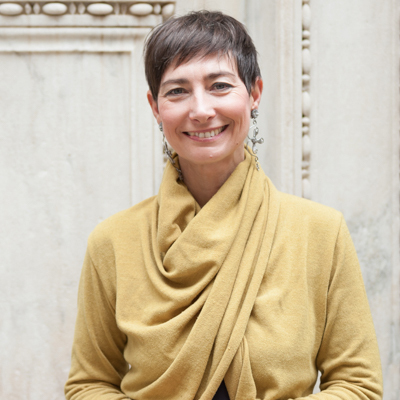 During my Jewish Venice tour, this is an important part of the itinerary and sometimes it is hard for me and my guests to focus on what happened before 1938. Rather, it is as if the Shoah were the privileged key to understand the Jewish history in Venice, a city where the word “ghetto” was born. So we jump from the recent history to the 14th and 16th century, constantly. Which is challenging, but also fascinating, because it helps understand the differences and the common thread. In regards to the Shoah, it is in the Campo del Ghetto Novo and the Campiello delle Scuole in the Ghetto Vecchio that our attention is drawn. In the Campiello delle Scuole an inscription on the wall of the Spanish synagogue reminds us of the 6 million from Europe, 8.000 from Italy and 200 from Venice that were assassinated in concentration camps. To be precise the number of the Venetian victims is 246, but I guess they preferred to round the number to a full figure. Oh, well. When we move into what used to be the first Jewish settlement, the Campo Ghetto Novo, then our attention gets caught by a large brick wall with a barbed wire on top. 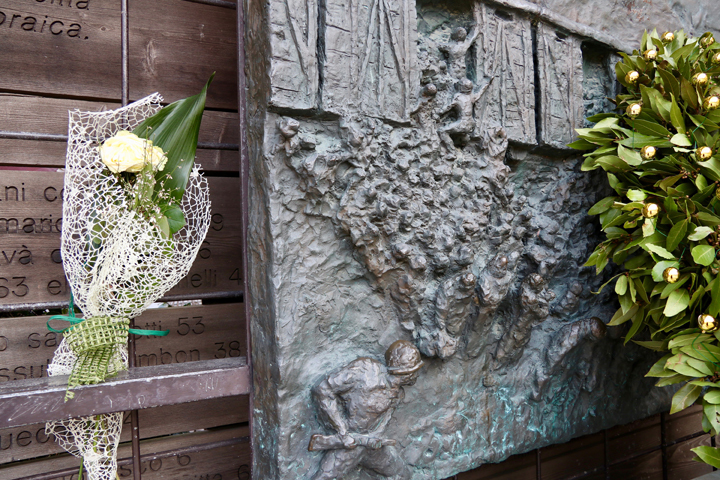 Below, we find the seven bronze bas-reliefs by Arbit Blatas next to two inscriptions. While we read the words by the Mayor of Venice and the French General, we are reminded that Venice was rounded up twice. The first day was on December 5th, 1943. The second day on August 17th, 1944. The barbed wire is not part of the art work designed by Arbit Blatas. Rather, it seems it was placed during the deportation times by the Nazis, after 1943. It definitely confers drama (and some confusion, as the Venetian ghetto was not born as a concentration camp). Blatas was born in Lithuania, the “Jerusalem of the North”, a country where over 100.000 Jews were killed. 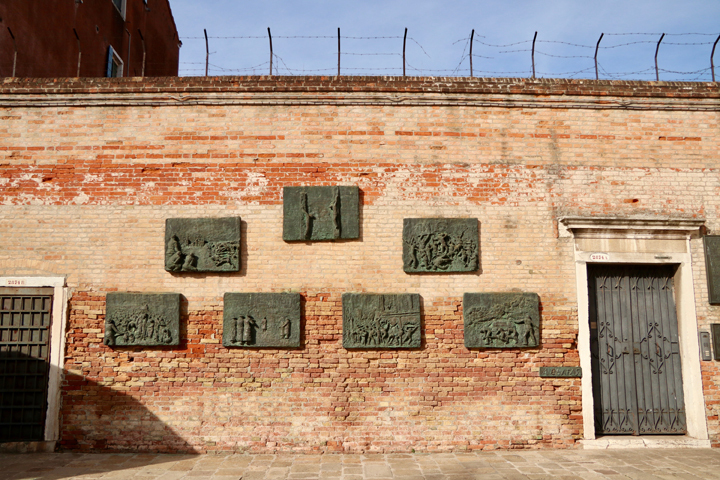 The project Arbit Blatas worked on in the 1970s brought a first outcome in the Venetian ghetto, inaugurated on April 25th, the Liberation Day, in 1980. His drawings appeared in the 1978 American television series “Holocaust” featuring Meryl Streep. Those drawings were the basis for four public memorials, consisting of seven powerful bas-reliefs, known as “The Monument of the Holocaust”, on permanent display in four countries: Italy, France, The United States and Lithuania. 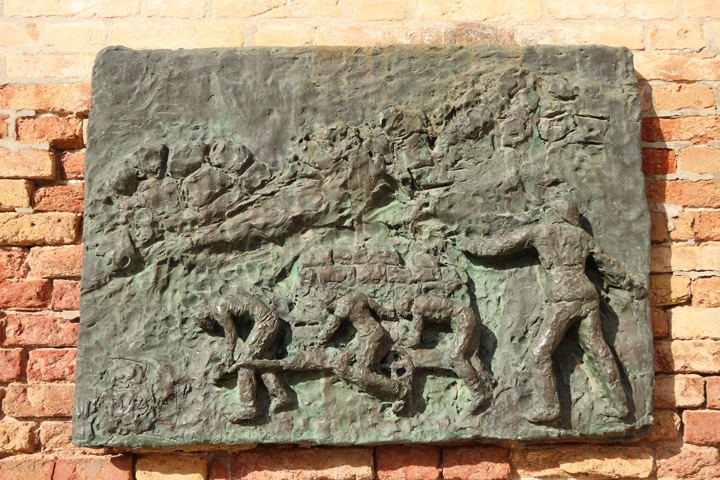 In 1989 Arbit Blatas donated one more memorial to Venice with the powerful “The Last Train” on the wall of the old people’s home of the Jewish community, built in 1890. Using bronze again and a technique of sculpturing the metal as if it were wood, Blatas left the faces and the details of the scene intentionally sketched and blurred. On the back of the relief, large wooden boards are lined horizontally behind an iron gate. They look just like that train that brought to death the Venetian Jews. Carved on the wood we read, one by one, the first and last name and the age of each victim that was deported. Blatas forces us to switch from the general concept of the Shoah to the single person that fell as a victim. And I find it so significant that the names are carved in wood, a perishable material reflecting the fragility of memory. Blatas died in 1999. In 1995 another international project started in Cologne: the Stolpersteine by Gunter Demnig. The stumbling blocks to remember the victims of the Shoah (not just the Jews) are everywhere in Europe, over 65.000 by now. The artist’s idea is to place a brass plaque of 10x10 centimetres on the street, by the door of the home or hospital where somebody was arrested to be then deported and assassinated. 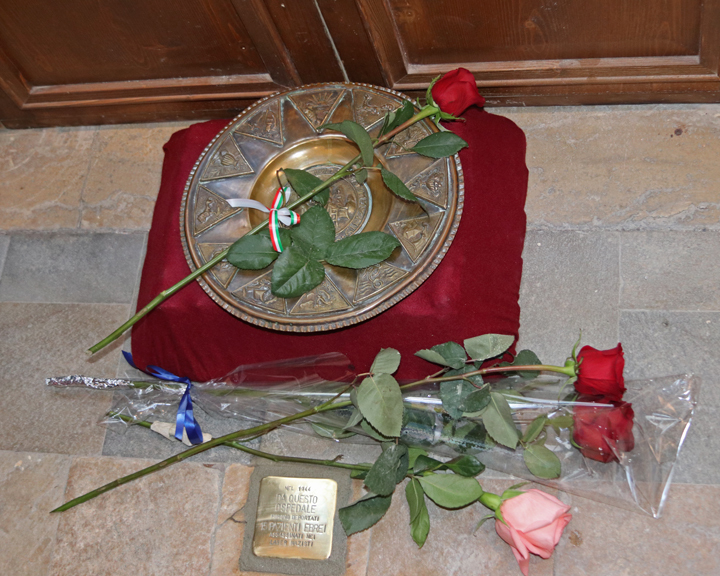 Last year, a few Stolpersteine were also placed outside the universities in Padua and Venice to remember Jewish students and professors that were banished as a consequence of the racial laws. On the plaque one reads the name of the victim, his date of birth, the day they were deported and, if known, the date of the death. When it comes to a large group of people the plaque only mentions the number of the victims and the date of deportation. The verb “stolpern” in German means to stumble, but you cannot trip over these plaques as they lie at the same level of the street. Your eyes will, though. Especially the young visitors to whom I show the “stolpersteine” are left moved and take photos, immediately. In a home, in a hospital, in a school, where the victims were living, working and feeling safe something arrived that stopped their normal life. Demnig comes to Venice every year to personally place the stones. During the ceremony, someone will recall an episode, what happened. A moment of storytelling that does not disappear even when the stone is left there, silent, to be stepped on every day. You can follow how many “stolpersteine” there are in Venice in the accurate database IVESER keeps online, carefully updated. You can also see where they are. And that’s a powerful message of this work as it brings you outside the ghetto, forcing you to wander anywhere in Venice. You will remember the Shoah not just in the Ghetto then. 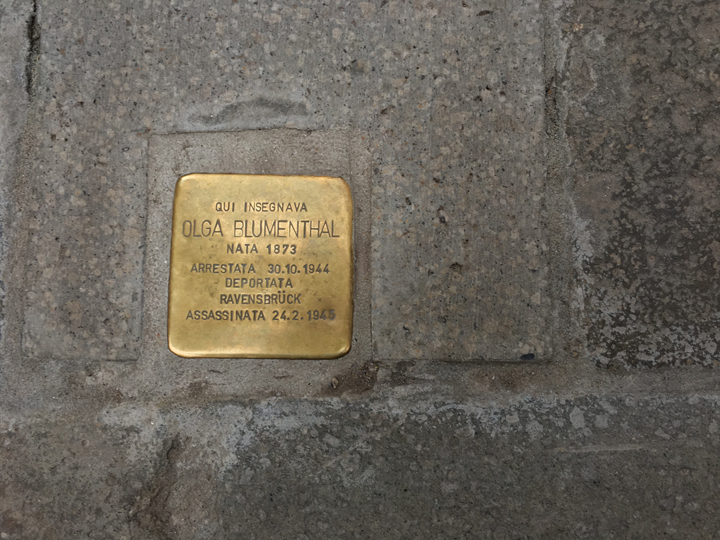 At the same time, the “stolpersteine” project highlights the person, a victim that was a citizen in the city, whose name was taken away and should not be forgotten.